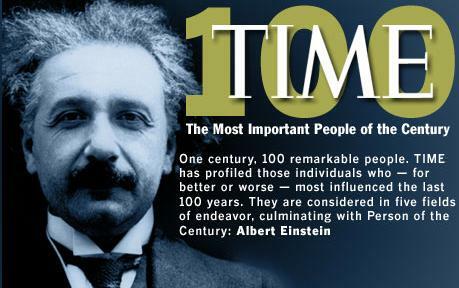 Albert Einstein topped the list of Time magazine's 100 Most Important People of the [twentieth] Century. Nothing surprising there. It was a pleasant surprise to me to see that the list went beyond politics and the entertainment industries and included representatives in the arts and design fields. 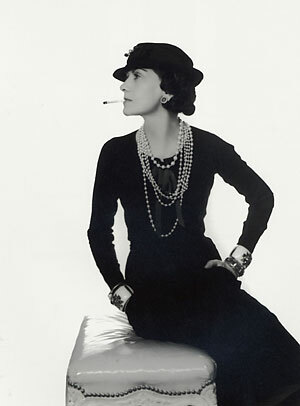 The list recognized one fashion designer - Coco Chanel, and one architect - LeCorbusier. (No doubt this sent Frank Lloyd Wright spinning in his grave.) The connections between these two extend beyond their inclusion on Time magazine's list. The connection between their design fields, fashion design and architecture, is substantial. This post begins to explore those connections. The roaring twenties set forth monumental changes not only in America but in Europe as well. There was a brief period of prosperity after the Great War and before the financial turmoil that followed. America was coming into its own in the design fields but Europe still led the way. Bright colors and intricate detailing were in vogue until the advent of a "little black dress" and a white "machine for living" changed the direction of design throughout the western world. Coco Chanel disregarded the typical approach to designing garments. Rather than executing variations of the clothing of the day she stepped back and took a fresh look at fashion design. The dress should not be a work of art that women had to shoehorn themselves into. Rather it should be easily wearable and comfortable. She believed that expensive material, bright colors, patterns, and ornamentation were not necessary to achieve a satisfying garment. The cut and drape were foundational and mattered much more. These design concepts are evident in her little black dress of 1926. Coco's design of the little black dress revolutionized fashion. The dress was completely reimagined. It was amazingly simple, especially compared to other dresses of the day. Designed to be worn by any woman, it was comfortable and versatile. It lacked any ornamentation other than diagonal pin tucks. The absence of color caused one to focus on the form. Accessories did not have to compete with ornamentation and could be simple and effective. If the accessories contained color, they really popped. Featuring black was also something new, giving it new status as a "color" (black technically being the absence of color). A color that, as it turned out, was slimming and flattering to the body. It is no wonder that variations on Coco's little black dress have persevered and are still common today. LeCorbusier was a student of architectural history but had no intention of replicating historic forms. He sought to reinvent architecture as he explained in his book Toward a New Architecture. He felt the building of the day should be taking advantage of new technologies and materials and that the ornamentation sported by such building was unnecessary. Building design should give more emphasis to function. These design concepts are evident in Villa Savoye of 1929. Corbu's design of the Villa Sayoye revolutionized architecture. Domestic architecture was completely reimagined. The simple box, lifted above the landscape on thin pilasters, stood in stark contrast to the revival style houses of the day. It was intended as a malleable prototype for middle class families. The house is devoid of all ornamentation, depending on the simple geometric beauty of its form and machine aesthetic. The shell of the house is pure white - representing purity and newness. Interestingly the interior breaks up the monotony of white wall with brightly colored walls and large modernist paintings. 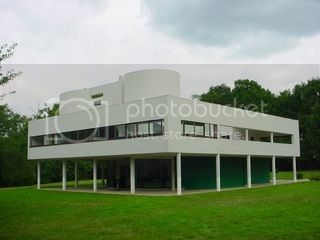 For the concepts and ideals set forth by Corbu in the Villa Savoye, it exists today as one of the most popular pilgrimages for architects and students of architecture. This architect included. The parallels between Coco's little black dress and Corbu's Villa Savoye become more evident the deeper you dig. In this post, I have only touched the surface of the connection between fashion and architecture. I intend to make other forays into this topic in future posts. I contend that architecture is connected to virtually all design fields, in very fundamental ways. That will be the topic of my next post. Please tune back in for my next post ..... Powers of Ten.